Is this slim-line monitor a worthy addition to a Mac setup? Fans of matte anti-glare screens, rejoice. With the Hanns.G HL196 19-inch display, you can wave goodbye to much of the annoying reflection from windows or lights that affects glossy displays. 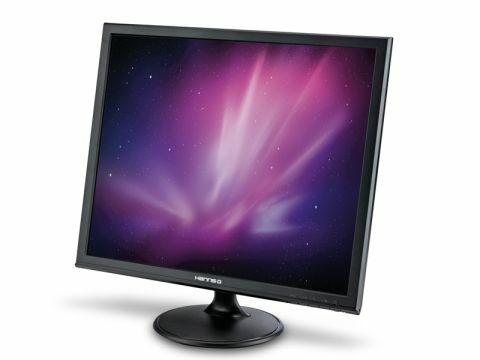 It's not the only thing we like about this monitor – it's thin and light, and can be hung on the wall with a VESA mount. On the back are both VGA and DVI-D connectors, and you can switch between the two using the control panel on the lower front edge. But the fact that the unit's so light means that when you press the buttons, you end up wobbling the whole thing from side to side. Putting the controls on the front wouldn't have been much better, since the whole thing rocks around when you touch the casing, and adjusting the angle of the screen made us rather nervous something would snap. It isn't height-adjustable either, so you'll likely need a stand. The 5:4 ratio screen isn't ideal if you plan to watch a lot of films on it, since these will be letter-boxed. But as a second monitor, it'll take up less room on your desk than most widescreens and gives plenty of extra workspace. As you'd expect, colours look slightly washed out next to a glossy Apple display, but seen on their own, they're decent, if not especially bright or vivid. There's a clear distinction between white and the lightest shades of grey, and between black and the darkest greys. The monitor's viewing angles were poor, though, with even slight sideways movements causing colours to change. It's a cheap and cheerful but unremarkable product, and bear in mind that you can get 19-inch widescreen monitors for less.